Odds are, many of the Walking Dead are dead bored. That’s the reality of deploying with a Marine unit in an area that has largely been pacified. First Battalion, 9th Marines, out of Camp Lejeune, N.C., must remain on its toes, but it is deployed in Nawa, Afghanistan, a community that has been highlighted by many experts as an example of success in the war in Afghanistan. 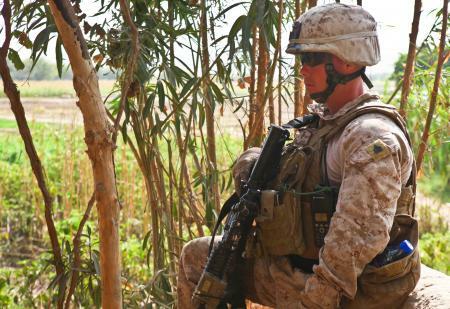 Nawa first showed substantial signs of improvement last summer, even as neighboring Marjah district remained a volatile area in which Marines fought for their lives daily. They’re both widely considered to be in better shape now — which means they’re being eyeballed for a transition in which Afghan security forces will take control. Marines will remain in the area in an advisory role, but in substantially smaller numbers. A new Marine Corps news release highlights the planning that must go into that. Nawa is “on the cusp” of transition, said Lt. Col. Tyler Zagurski, commander of 1/9. It’s worth remembering just how bad Nawa was a few years ago. A rural farming community of about 80,000 people, it was under Taliban control when Marine forces assaulted it in July 2009. This AP dispatch described the early portion of that operation, which involved about 4,000 Marines and sailors fanning out across Nawa and neighboring Garmser districts. At the time, Marines with 1st Battalion, 5th Marines, out of Camp Pendleton, Calif., told embedded journalists that they were amazed at how determined Taliban fighters in the region were. Some of those fighters likely escaped to Marjah, tangling with Marines regularly through last fall. Im not tryin to hype anything up but how the hell would you know that were bored. No its not none stop fighting but several of my marines have returned stateside and are still having surguries, so you might want to do some investigating before you say anything about where we are. I could care less about what the news says. You went out with p.s.d anyway they are probaly the one who are bored they dont do anything except drive around. Go get with wpns co. or bravo co. then write a story on how ‘bored’ we are. Odds are you(the writer of this article) didn’t fully research the Walking Dead, made a general statement about only a part of a unit, which I suspect insulted all of the 1/9 Marines! As with all deployed units there are many tasks supporting the entire mission, don’t degrade one single Maeine & their service or their deployment! You should know better! Shame on you! No disrespect was intended with this blog post. We all know that Afghanistan is a dangerous place, and that things can still turn sideways pretty much anywhere in Helmand province. We’ve covered that at great length on this blog in the past. With that said, it has been widely reported that Nawa as a whole has slowed down. That’s why I said the odds are that “many” of the Walking Dead are bored. Not all. I’ve heard similar reports from 3/6 Marines that I embedded with last year in nearby Marjah, now that they’re back there. Again, no disrespect intended. I’ll be careful with making blanket statements in the future, even when I’m already making it clear that we all understand there are differences in every area of operations.